Last Saturday, we celebrated the Free Software Foundation's thirtieth birthday with a party to remember. At thirty years old, the FSF was the first non-profit organization dedicated to free software, and is one of the oldest digital rights organizations in the world. This anniversary is a good reason to celebrate, and free software enthusiasts joined the festivities from all over, attending the party in Boston, watching the livestream of toasts by Allison Randal, Eben Moglen, Vernor Vinge, Karen Sandler, Bradley Kuhn, and Cory Doctorow, followed by an inspiring speech by Richard Stallman, and hosting their own celebrations by plugging in to our party network. We even surprised partygoers with a performance of "The Free Software Song" and the Bulgarian song from which it takes its melody, "Sadi moma bela loza," sung by members of the Boston-area Bulgarian groups Divi Zheni and Zornitsa. The FSF also hosted a User Freedom Summit in Cambridge, with more than 80 attendees, who took part in a copyleft.org hackfest, an introduction to the decentralized Web, a discussion of the free software BIOS/UEFI replacement Libreboot, an intro to GnuPG email encryption, and Eben Moglen's look at the next fifteen years of the free software movement. and a ton in other locations. If you organized an event to celebrate the FSF's thirtieth anniversary, tell us about it! Send your photos or blog posts to campaigns@fsf.org -- we'd like to share them! 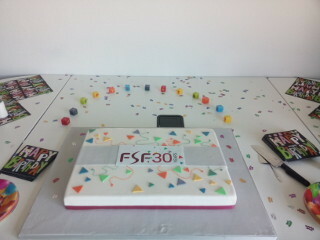 So, what does the FSF have planned for the next thirty years? Plenty. We're going to continue to fight for user freedom, alerting the public to the dangers of nonfree software in tiny computers everywhere, enforcing the GPL, and encouraging more people to use free software every day. We just upgraded our CiviCRM instance, which makes staying in touch with you even easier, and we've got more technology upgrades planned, to make our work more efficient. We have added new staff positions in the past two years, and we'd like a few more -- a bigger team will help us expand our reach, share urgent information with you faster, and deepen our relationships in the free software community. But to do that, we need you. We have over 3,400 members, and more than two-thirds of our funding comes from individuals -- members and one-time or occasional donors of sums large and small. We rely on the free software community's generosity, and there are many ways to give. The third edition of Richard Stallman's essay collection, Free Software, Free Society, is now available in hardcover and paperback. And we still have commemorative FSF30 t-shirts, as well! Members enjoy a 20% discount on all purchases in the GNU Press shop. Thanks for celebrating with us. In the coming weeks, keep an eye out for recordings from the User Freedom Summity and party, more on LibrePlanet 2016 (you can submit a session proposal through November 16), a community survey that will help us shape the next thirty years of the FSF, and guidelines for repositories that host free software projects, authored by Richard Stallman.